Gastown’s Pidgin restaurant celebrates the 2014 Sochi Winter Olympics by offering guests their very own taste of Putin’s Pride. Fashioned by barman Robyn Gray, Putin’s Pride is a limited edition cocktail made with Mount Gay Rum, Cointreau, pineapple syrup, coconut water and is garnished with rainbow ice cubes and rimmed with political controversy. 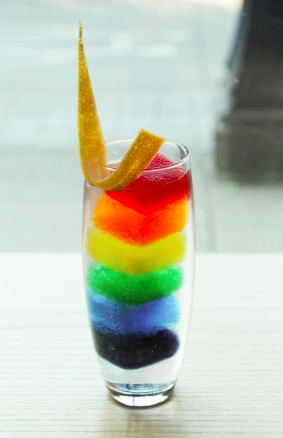 Leave this colourful cocktail sitting for long enough and watch it transform into a mixture that resembles Sochi tap water without the muddy aftertaste. Unlike the Sochi hotel rooms, this tasty cocktail is ready for guests to enjoy throughout the 2014 Olympic Games (until February 23rd). Pidgin is open Mondays to Thursdays from 5:00pm to 12:00am, Fridays to Saturdays from 5:00pm to 2:00am and Sundays from 6:00pm to 12:00am.